Jon Johnson Photo/Gila Valley Central: Hail is piled up along side the roadway after the Oct. 8-9, 2016 storm. 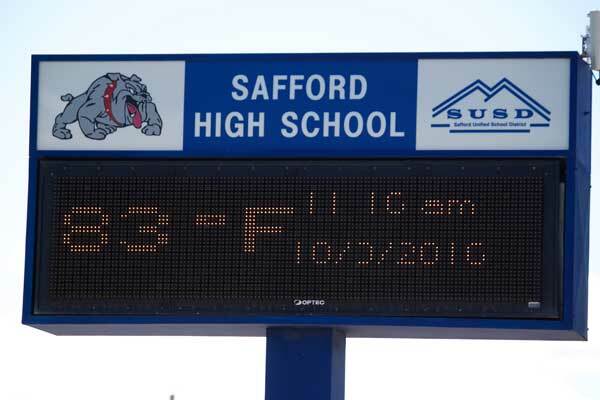 SAFFORD – The Safford School District has announced that its schools will remain closed until Oct. 24 to clean up damage caused by Saturday night’s freak hail storm. 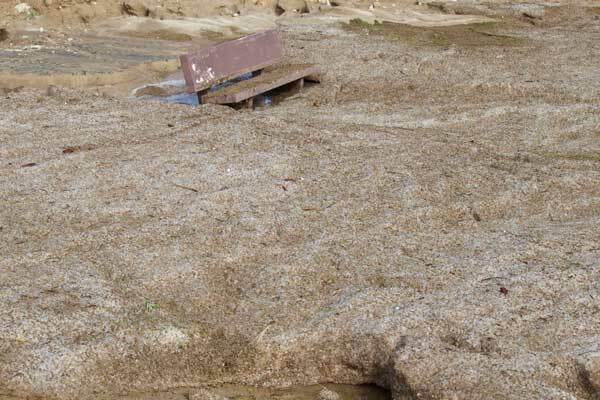 According to a release from Superintendent Ken VanWinkle, the storm left many of the district’s schools with major flood damage. He added that the district is working with CRS Restoration, The Trust insurance and the Arizona School Facilities Board to clean up the schools and plan the district’s next steps. Jon Johnson Photo/Gila Valley Central: Safford schools suffered flood damage in the storm and will be closed until Oct. 24. While teachers are paid on a contract basis, classified staff members are generally paid on an hourly basis. There has been no information available as to what the school plans to do to keep those employees working during the shutdown. On Sunday Dorothy Stinson maintenance professional Frank Gutierrez told Gila Valley Central that several of the elementary school classrooms suffered water damage, as well as its cafeteria and media center room. The storm, which dumped up to 5 to 6 inches of localized rain in some areas of Safford, was intensified by a hail storm which beat the leaves off trees that slowed drains. 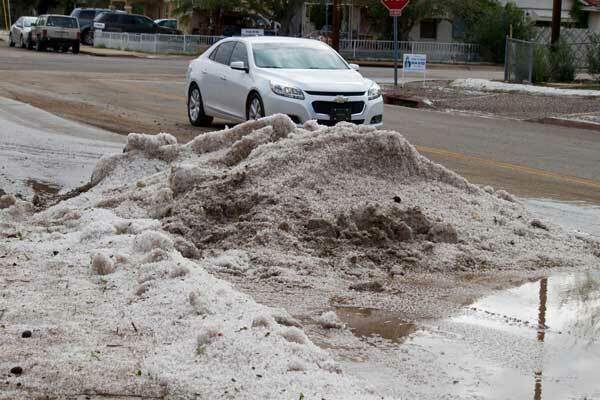 The unprecedented hail caused significant damage throughout Safford and Solomon and the water flooded numerous residences, businesses and schools. 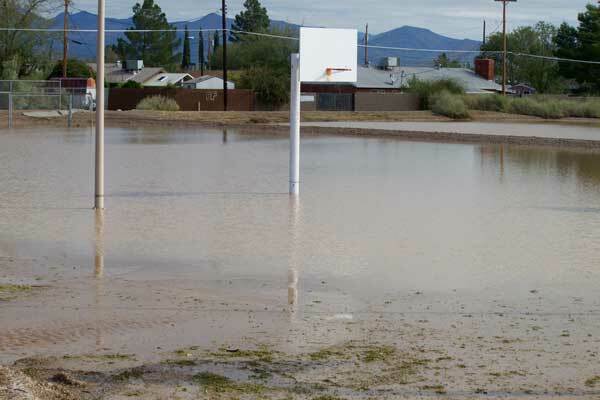 Jon Johnson Photo/Gila Valley Central: Many parks and other areas were left under water after the storm. To help parents cope with having their children off from school, the Boys & Girls Club of the Gila Valley will stay open all day for Safford students for the weeks the schools are closed. The club is charging families who utilize it an extra $20 per week per child to help pay for the additional staff necessary to be open all day. Unfortunately, the club is not accepting additional members at this time, but if parents whose children attend the club opt to keep their children home, those on a wait list will be offered the open spots. VanWinkle said the district would be doing whatever it can to speed up the cleanup process. The release did not state how the schools expect to make up the lost days of instruction, but it could extend the school year or reduce time off over upcoming breaks. At the end of the statement Van Winkle encouraged those who have offered to help the schools put their efforts into helping their neighbors. Brugman said his staff has seen firsthand how the community has come together to assist one another, and by Monday afternoon, a good portion of residences, city streets and businesses were cleaned. Jon Johnson Photo/Gila Valley Central: A freak storm caused significant flood damage late Saturday night through Sunday morning.